This section is organized into A Vision of the Future, The Reality of Today, The Demise of Degrees and Student Debt. Opinion: Charging for knowledge is antiquated: Creator of popular EPIC 2020 video says education is seen increasingly as a global commodity. Link. eCampus News, 16 August 2012, Bill Sams. Free universal knowledge is the most valuable resource in the world. Knowledge is an economic good that becomes more valuable as more people “consume” it. The distribution of knowledge is in the process of transitioning from a scarce resource to a commodity. Entering the Golden Age of Education here is a PDF copy of the full version of the article. Degree Qualification Profiles: The Lumina Foundation is a leader in the development of an alternative measurement of learning that moves away from grades and credit hours. The Carnegie Unit: A report by the Carnegie Foundation on the problems and strengths of the Carnegie Unit. Answers for Middle-Aged Seekers of MOOCS: NYT, September 4, 2013. Cathy Davidson, Professor of English at Duke University. This is an excellent survey article on MOOCs. The comments thread is also very worthwhile. Clearing Up Some Myths About MOOCs: HASTAC web site: 11 June 2013. Cathy Davidson. The article is written from her perspective as both a MOOC professor and a MOOC student. The Minds Behind the MOOCs. Online Courses blog, Staff Writers. This is a nice overview graphic of what is happening with the growth of MOOCs. Thank you Allison Morris for the link. In 15 Years From Now Half of US Universities May be in Bankruptcy. Clayton Christensen. Both Sides of the Table Blog, Mark Suster, March 3, 2013 Link. California Shifts the Ground Under Higher Education, March 13, 2013, Chronicle of Higher Education. Link. Ohio high school students could earn college credit, brush up on skills, through possible online partnership with Udacity. Cleveland Plain Dearler, Feb 17, 2013. Link. Over the past two years Khan Academy videos have been viewed more than 200 million times. The site is used by 6 million unique students each month (about 45 million total over the last 12 months), who have collectively solved more than 750 million problems (about 2 million a day), and the material, which is provided at no cost, is (formally or informally) part of the curriculum in 20,000 classrooms around the world. American Council on Education to Assess Potential of MOOCs, Evaluate Courses for Credit-Worthiness. Press release 13 November 2012. Link Working with institutional leaders, organizations like Coursera and the University Professional and Continuing Education Association (UPCEA), and supported by generous funding from the Bill & Melinda Gates Foundation, ACE will leverage its position as the major coordinating body for all the nation’s higher education institutions to identify and answer questions about the disruptive potential of this new and innovative approach to higher education. College Is Dead. Long Live College! Time, 18 October 2012, Amanda Ripley. Link Now, several forces have aligned to revive the hope that the Internet (or rather, humans using the Internet from Lahore to Palo Alto, Calif.) may finally disrupt higher education — not by simply replacing the distribution method but by reinventing the actual product. New technology, from cloud computing to social media, has dramatically lowered the costs and increased the odds of creating a decent online education platform. A Facebook for Research: Rogue Med Student Tackles the Web’s Ultimate Irony. Link. WIRED 17 August 2012. Tim Berners-Lee created the web as a better way of sharing academic research. But it soon morphed into something much, well, larger. Inside the Coursera Contract: How an Upstart Company Might Profit From Free Courses: The Chronicle of Higher Education, 20 July 2012. Link. Coursera has been operating for only a few months, but the company has already persuaded some of the world’s best-known universities to offer free courses through its online platform. Top Universities Test the Online Appeal of Free: The New York Times, 18 July 2012, Link. A few months ago, free online courses from prestigious universities were a rarity. Now, they are the cause for announcements every few weeks, as a field suddenly studded with big-name colleges and competing software platforms evolves with astonishing speed. Universities Reshaping Education on the Web: The New York Times. 17 July 2012. Link. As part of a seismic shift in online learning that is reshaping education, Coursera …announces a dozen major research universities are joining the venture. U-Va. Leaders Appear Not To Have Known of Online Deal, The Washington Post, 17 July 2012. Link. University Board fires President and then rehires the President over not moving fast enough on online learning. Unknown to each the University was joining up with Coursera to provide free online courses. Classroom Lectures Go Digital, New York Times, 24 June 2012. Link. The virtual teacher has arrived. A discussion of Video-On-Demand, VODcasts such as TED Ed and the Khan Academy. Computerizing the Campus, A different path to a college degree could expand opportunity and save money. Barron’s, June 16, 2012. Link. “The government should support a strategy to ensure that a high-quality and growing ‘catalog’ of free or nearly free edX-style offerings is available across all the major categories of university and career college training. Got a Computer? Get a Degree. Opinion Pages NY Times, May 6, 2012. Link. Should Harvard and MIT offer credit to obtain their degrees online? Harvard and MIT Team Up to Offer Free Online Courses: NY Times, May 2, 2012. Link. The coming battle of the Titans in education. The winners will be students. MIT news link. Joint partnership builds on MITx and Harvard distance learning; aims to benefit campus-based education and beyond. The Stanford Education Experiment Could Change Higher Learning Forever: WIRED, March 20, 2012. Link. 160,000 in 190 countries take the course. The 23,000 that passed the course represent more students than most professors will ever teach in their careers. The Higher Education Monopoly is Crumbling As We Speak: The New Republic, March 13, 2012. Link Reviews the impact of the Stanford AI course as well as the launch of other offerings. Death Knell for the Lecture: Technology as a Passport to Personalized Education: New York Times, December 5, 2011. Link Nice review of online courses. MIT Expands Its Free Online Courses: New York Times, December 19, 2011. Link Announces MITx. Course is free and if you pass there is a modest assessment fee that gets you a course certificate. X Prize Founder Aims to Fix Education; Anyone Have Some Ideas? : Forbes, March 11, 2012. Link. $10 million prize offered for the best solution. Disruptive innovation – in education: Kurzweil AI news, April 20, 2012. Link. Outlines the beginning of MIT’s Open Learning Enterprise. MIT launches student-produced education video initiative: Kurzweil AI News, April 26, 2012. Link. 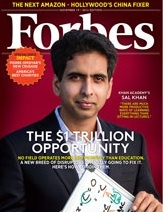 Sal Khan challenges 10,000 MIT students to make science and engineering cool. Learning: No longer a textbook case: Wake Forest News Center, April 29, 2011. Link. Students allowed to tailor each course to their learning style. Apple scores with digital textbooks and app: USA Today, Feb 1, 2012. Link Apple expands its textbook offering on iBooks with $15 textbooks. A “Place” for Higher Education: Inside Higher Ed, April 23, 2012. Link makes the point that place can be an important feature of education. Earning a degree with competency, not credits, eCampus News, August 7,2012. Link. Students at the University of Wisconsin (UW) now can earn college degrees based on proven competency in a subject, making UW the first publicly funded school in the United States to launch a competency-based degree program. Making it Count, Inside Higher Ed, June 15, 2012. Link. A pathway to college credit for online courses already exists – one that experts say many students may soon take. On-line courses combined with prior learning assessment systems results in granting of transferable credit for college-level learning gained outside the traditional academic setting. A GED for College? Grads with degrees are filling traditionally blue-collar jobs: The Chicago Tribune, March 11, 2012, Clarence Page. Link Could millions of college dropouts get a second chance through a GED-style equivalent of a college diploma? What You (Really) Need to Know: The New York Times, January 20, 2012. Link. Provides a review of how the world is changing compared to an unchanging traditional education system. Screw U: The Next Bubble May Be Higher Education. Link. 1 August 2012, Don Bauder, San Diego Reader. In economics, a bubble is something that trades at prices far beyond its intrinsic value. Fasten your seat belt: the next bubble may be higher education. Family Net Worth Drops to Level of Early ’90s, Fed Says: The New York Times, June 11,2012. Link. From a median family net worth of $126,400 in 2007 to $77,300 in 2010 the median family has lost over a decade of wealth accumulation. Student Loan Interest Rates Loom as Political Battle: The New York Times, April 20, 2012. Link. If action is not taken before July 1 interest on student loans will double to 6.8%. Offical Calls for Urgency on College Costs: The New York Times, November 29, 2011. Link. Education Secretary Arne Duncan urged higher-education officials to “think more creatively – and with much greater urgency” about ways to contain costs and reduce debt. The wonderful, learned a lot. Wonderful post, have learn t a lot !! Wow i am really impressed by your article, i was wondering may i use your article in my upcoming book, by your kind permission?? Hi Pinterest, Thank you for asking. Yes, please feel free to use anything on the site. EPIC 2020 was done with a Creative Commons license. Which of my articles are you thinking of using? Also, if there is anything else I can help you with please do not hesitate to contact me: samsw@ohio.edu My passion and purpose in life is to facilitate the discussion and thinking about how education can be improved. Thank you for the kind words. Your appreciation of my efforts mean a great deal to me.